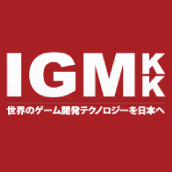 ABOUT IGM KK James Hursthouse and Yoshikazu Furuhata founded IGM K.K. in April of 2008 to represent the best in game middleware technology in the Japanese market. We also offer general Japan market development consulting around game technology and game content. If you are a games company, or games technology company looking for a low-cost, low risk, effective way to begin accessing the Japanese market, please contact us using our Contact Form. IGM significantly increases the ease and speed with which your product can be out in the marketplace generating revenue, with a ready to go Japanese language marketing and support infrastructure.